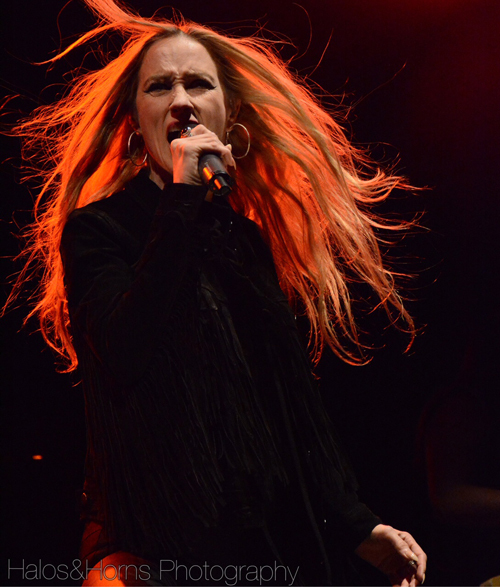 "It is with crushed hearts that we announce that Jill Janus—frontwoman for the California heavy metal band Huntress—passed away on Tuesday, August 14. A long-time sufferer of mental illness, she took her own life outside of Portland, Oregon. Janus spoke publicly about these challenges in hopes of guiding others to address and overcome their mental illness. Janus was a truly special creative involved with numerous musical projects including her role as vocalist for female metal/hard rock cover bands The Starbreakers and Chelsea Girls. In addition, Janus was co-composer and creator of an upcoming rock opera with Trans-Siberian Orchestra’s Angus Clark and had a decade-long career as NYC DJ Penelope Tuesday. Her musical career began in childhood. If you or someone you know might be at risk of suicide, Call 1-800-273-8255 to reach the National Suicide Prevention Lifeline. It provides free and confidential support 24 hours a day, seven days a week for people in suicidal crisis or distress." "I dont do much posting of things, and to post on something so personal and painful is extra strange but it feels necessary. Jill Janus and i spent 9 years together creating a home, having a family and building our passion project Huntress. The devastation of knowing I will never see her again is the most gutting emotion i have ever experienced. Baby, I hope you have found the peace that you couldn't find on this planet. I miss you so much and will always carry a piece of you in my heart. See you on Aldebaran."